A brilliant flash of radio waves from the distant universe has given a unique glimpse of the gas that lies between galaxies. The flash was captured and analysed by a mostly Australian team, using CSIRO’s Parkes telescope and the results were published in the journal Science today. "This flash lasted just a third of a millisecond, making it one of the briefest we've seen," said research team co-leader Dr Ryan Shannon of CSIRO, the International Research Centre for Radio Astronomy Research (ICRAR) and Curtin University. Called fast radio bursts, or FRBs, such cosmic flashes were discovered with Parkes in 2007. Just 18 have been spotted to date, most with Parkes. Astronomers think that between 2,000 and 10,000 go off all over the sky every day but their cause is unknown. Coming from a small patch of sky containing only distant galaxies, the flash in question, FRB 150807, seems to have originated more than a billion light-years away. Dr Vikram Ravi of Caltech who co-led the team with Dr Shannon said it was also exceptionally bright. "By far the brightest measured since the first one in 2007," Dr Ravi said. Combined brightness and distance meant FRB 150807 offered an unprecedented view of the thin gas in space between galaxies. Intergalactic gas, also called the cosmic web, 'feeds' galaxies, making them grow. It can alter radio waves passing through it, like a stained-glass window colouring light. The 'imprint' on FRB 150807 shows that the intergalactic gas is calm and has very weak magnetic fields, qualities scientists had predicted but were unable to measure until now. 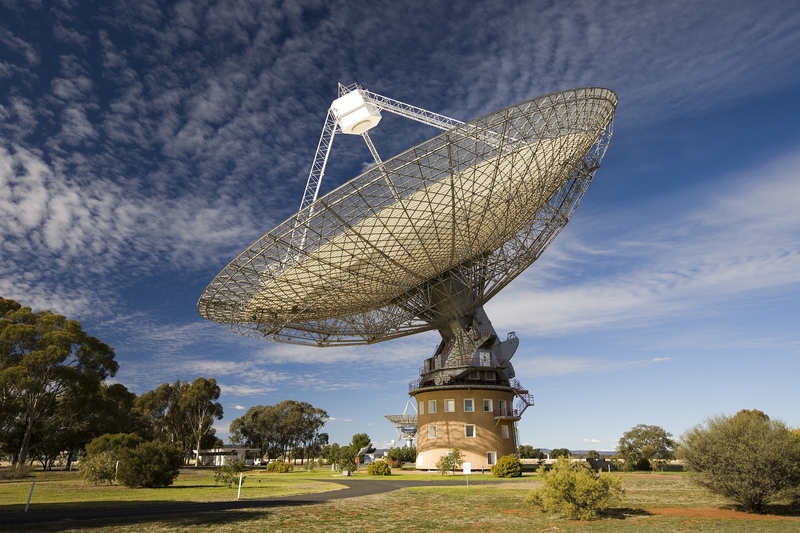 FRB 150807 was found with a real-time detection system developed by Swinburne University of Technology that is used on the Parkes telescope to study pulsars and fast radio bursts.